This Contemporary Two Piece, which I have now in my Collection is very popular and is available in a wide range of colours and fabrics. There are really fabulous summer pinks, greens, blues with a great demand for the very popular lime green at the moment. The main feathure of this top and skirt, as seen here in the Deep Blue, is its exaggerated shoulder line and pepum, on one side. This pencil skirt is available in different lengths and styles (there is also an A–line skirt available in this style). Mothers of the Bride and Guests at Weddings have chosen this style, but it has also been popular for the Day At the Races. 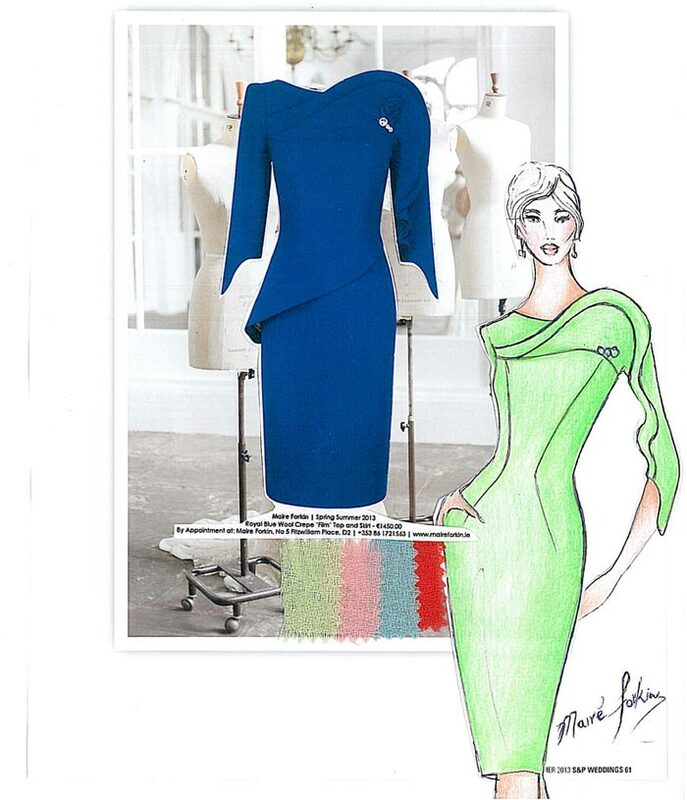 It is also available in a simpler hour glass style dress in this slim fitting silhouette, as seen here in the drawing in lime green. It is a strong, confident and glamorous with just the right amount of bling!